While enrolment in tertiary education has increased dramatically over the past decades, many university-aged students do not enrol, nor do they expect to earn a university degree. While it is important to promote high expectations for further education, it is equally important to ensure that students’ expectations are well-aligned with their actual abilities. 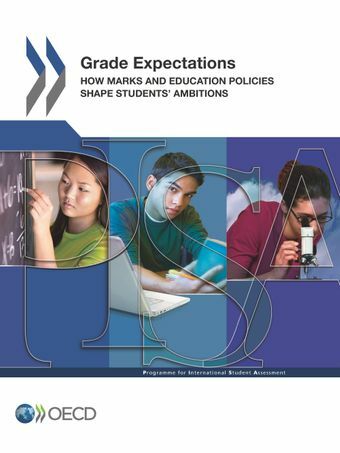 Grade Expectations: How Marks and Education Policies Shape Students' Ambitions reveals some of the factors that influence students’ thinking about further education. The report also suggests what teachers and education policy makers can do to ensure that more students have the skills, as well as the motivation, to succeed in higher education. In 2009, students in 21 PISA-participating countries and economies were asked about their expected educational attainment. An analysis of PISA data finds that students who expect to earn a university degree show significantly better performance in math and reading when compared to students who do not expect to earn such a university degree. However, performance is only one of the factors that determine expectations. On average across most countries and economies, girls and socio-economically advantaged students tend to hold more ambitious expectations than boys and disadvantaged students who perform just as well; and students with higher school marks are more likely to expect to earn a university degree – regardless of what those marks really measure. What Do Students Expect to Do after Upper Secondary School? What Behaviours Do Teachers Reward? What Is the Relationship between Marks and Educational Expectations?